Pete Ostrowski and the lucky recipient of the feature trophy. Pete drove Bill Thompson's car to the feature win. Thank you to McKay's Digital Images for the pictures. 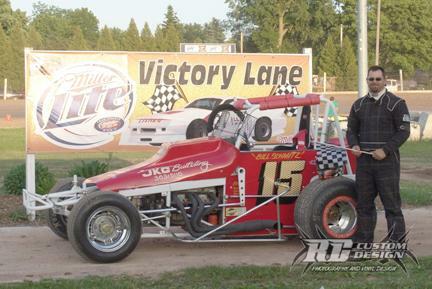 Ten cars showed up at Wilmot for what turned out to be the MSC’s last race of the year. 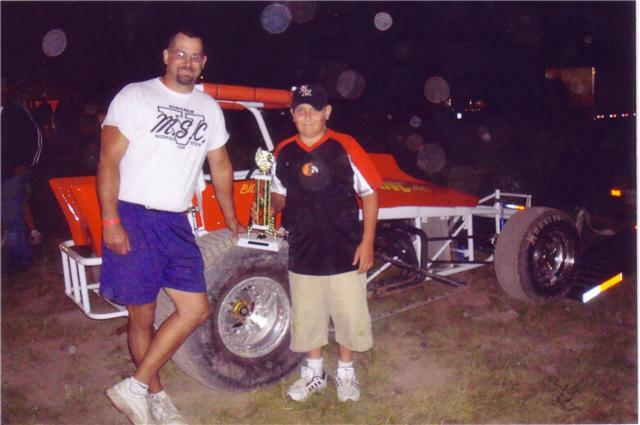 With rain outs and track closings, this was our last race for 2009. A very wet track set the schedule back more than a hour, while the IRA crew tried to grade it off and pack it in. We lost one car when the #55 car being driven by Roger Schmitz suffered a frozen rear axle in hot laps. The line up for the heat race was Alan Kautz on the pole with Doug Drews on the outside. The second row was Bill Behm and Bill Schmitz. 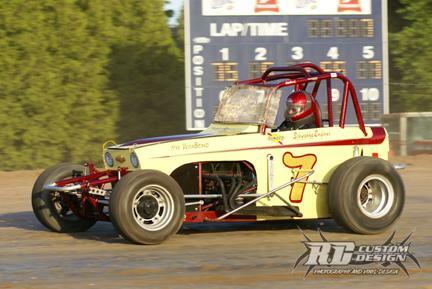 The third row was Steve Muth and Pete Ostrowski in the #7 Bill Thompson car. The fourth row was Al Feller and Kent Rusk, with Dan Muth bringing up the rear. Being the first race of the night, the track was still pretty slick in places. After a few spinouts and a great duel between Bill Schmitz and Pete Ostrowski, the finish was : 1st Bill Schmitz, 2nd Pete Ostrowski, 3rd Ron Feller, 4th Steve Muth, 5th Dan Muth, 6th Kent Rusk, 7th Alan Kautz, 8th Doug Drews, and 9th Bill Behm. The line up for the feature race was an invert of the heat race finish. The track was now in great shape, with a lot of bite. Pete , Steve, and Bill Schmitz found the track to their liking and flew to the front, with Al Feller chasing them. Al ‘s car developed steering problems. Doug Drews went into the infield with car problems. With a few laps to go, Steve Muth got too high coming out of the 4th corner and hit the wall, flipping the car. Luckily Steve was alright, but his car was a mess. Pete and Bill put another good show on fighting for the lead, with Pete pulling out the win. The veteran driver had a big grin on his face when he came back to the pits after pictures and giving the trophy to a kid in the stands. Bill Schmitz finished 2nd, Kent Rusk had another great race, finishing 3rd. After staying out of the way of spinning cars and not breaking, Bill Behm finished 4th. 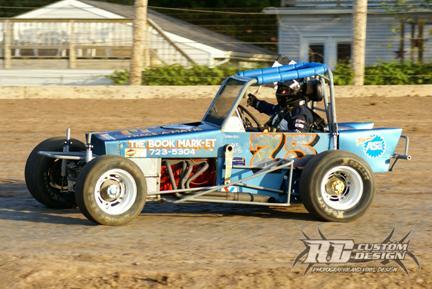 5th was Alan Kautz, 6th Roger Schmitz in Dan Muth’s car, 7th Ron Feller, 8th Steve Muth and 9th Doug Drews. Thanks to all the members of the MSC who made the sometimes long trips to our races this year. Also thanks to Terry Blanckaert and Tim Dessereau for doing the pit steward duties. Bill Schmitz winner of the feature race giving the trophy to Kyle Meyer of Charlesburg, WI. After racing on one of the slickest tracks at Plymouth, we found an almost perfect track at Chilton. It was the kind of track surface that the MSC cars are made for. With nine cars on hand, one heat race was held. Corey Pieper drew the pole position with Bill Behm on the outside. Row two was Brian Titel and Alan Kautz. Row three Mike Araco and Jerry Bergdorf. Row four Terry Pulver and Bill Schmitz, with Bill Thompson bringing up the rear. Behm was able to take the lead on the outside groove which had more bite than the inside. On lap three the 16 car of Alan Kautz left the track with mechanical problems. Meanwhile, Bill Schmitz was making a run for the front in the 15 car with Bill Thompson right on his tail. Pieper was able to get to Behm’s rear tire, but could not make the pass. The finish was #75 Behm, #55 Pieper, #15 Schmitz, #7 Thompson, #5k Titel, #12 Bergdorf, #5 Pulver, #1 Araco, #16Kautz dnf. The track was still in great shape for the feature race. With the invert from the heat, it was Araco on the pole with Kautz on the outside. Row two Pulver and Bergdorf. Row three Titel and Pieper. Row four Behm and Thompson. Row five Schmitz. The #1 car of Araco was able to keep the lead for three laps until Pulver was able to make the pass. Schmitz came from last to third by the fifth lap. On lap eight Schmitz passed Pulver for the lead and never looked back. Meanwhile, Pieper and Thompson were getting through traffic on their way to the front. Farther back in the pack Behm and Titel were dueling, with Behm finally getting by the K5 car. On lap 12, Jerry Bergdorf got up in the loose dirt and hit the wall, bringing out the yellow. After the restart Thompson got by Pulver for second and Pieper spun out in turn four. The finish was Schmitz, Thompson, Pulver, Araco, Behm, Titel, Kautz, Pieper and Bergdorf dnf. 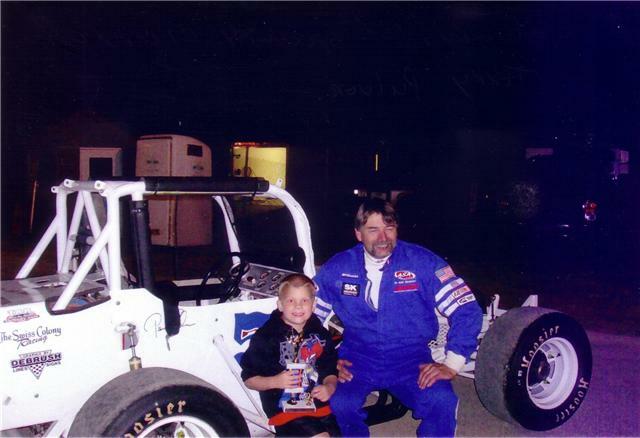 Bill Schmitz gave the feature trophy to Kyle Meyer of Charlesburg, who came back to the pits after the races for a picture. We are all glad that Jerry Bergdorf was not hurt and hope that his car is not too badly damaged. A good turnout of eleven cars came to a Plymouth track that was dry and slick. A one-groove track in the heat races gave the cars starting on the pole a big help. In the first heat race Bill Behm started on the pole with Alan Kautz on the outside. In the second row it were Brian Titel and Corey Pieper. The third row was Mike Araco and Kent Rusk. 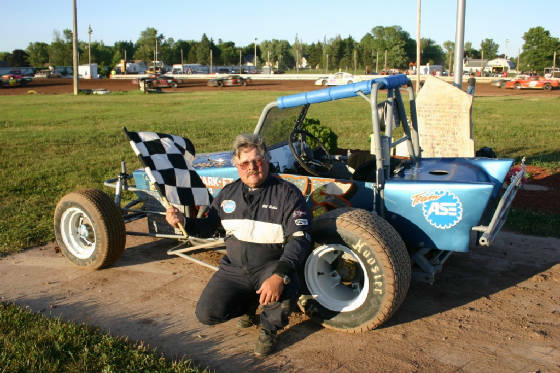 Bill Behm was able to hold Brian Titel off and win the race from the pole. The rest of the cars shuffled around with Corey Pieper coming in third, Mike Araco was forth in the newly built Aaron Solsrud replica car (in it’s first night out), and Kent Rusk and Alan Kautz finished fifth and sixth. The second heat was much like the first with Bill Schmitz starting on the pole and leading the whole race for the win. Steve Muth did a good job on the slick track coming from fifth to finish second. Ron Feller finished third after starting in fourth. Bill Thompson and Doug Drews brought up the rear. After watching the other classes of cars slide around in their feature races, the vintage mods went out for their 12 lap feature. There was some rubber down on the track by this time, so some passing was able to be done. Eight cars made the call, with the other three loading up with various ailments. Kent Rusk took the lead from his second starting position. Corey Pieper lit out after him from the fourth position. Rusk and Pieper swapped positions throughout the race. Further back Bill Schmitz raced through the pack to third place from his last place start. Feller, Araco, and Titel fought for fourth with Kautz and Behm bringing up the rear. At the checkered flag it looked like Pieper won with Rusk crossing the line at the same time. The scorers reversed the decision, giving Kent Rusk his hard earned feature win, with Corey Pieper second. Bill Schmitz was third with Feller, Araco, Titel, Kautz, and Behm rounding out the field. The MSC started the 2009 racing season at The Columbus 151 Speedway on Friday, May 29th. Nine cars were on hand for a great evening on the asphalt. 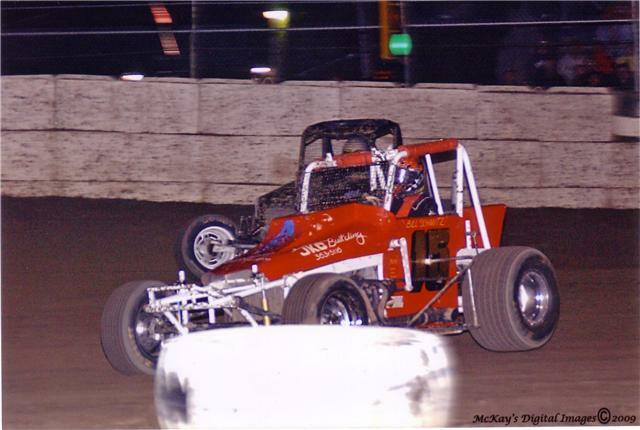 In the heat race, Ron Feller and Bill Behm threaded through the cars at the front and fought for the lead the entire race. Terry Pulver, Corey Pieper, and Brian Titel raced for 3-4-5. Bill Schmitz was black flagged for oil smoke from a leaking cover gasket. Behm could not catch Feller, so the finish was Feller, Behm, Pulver, Titel, Pieper, Doug Drews, Kent Rusk, Schmitz and Alan Kautz. In the feature race Corey Pieper got by Schmitz for the lead with Pulver hot on his tail. Ron Feller was running 4th with Behm trying to catch him. Pulver and Pieper swapped leads with Schmitz running 3rd. Halfway through the 15 lap race, Behm’s car lost power, Brian Title passed him and Feller pulled away. 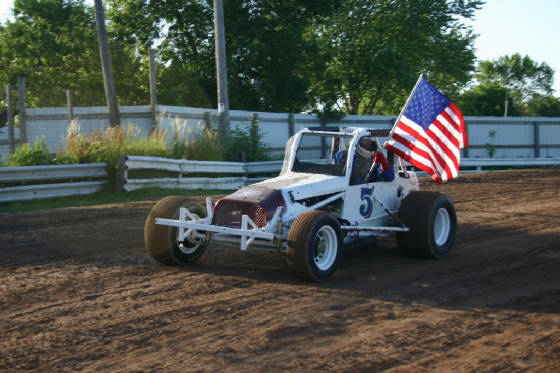 Terry Pulver got by Pieper for the lead, Schmitz finished 3rd, Feller 4th, Titel 5th, Behm 6th, Kautz 7th, Rusk 8th, Drews 9th. 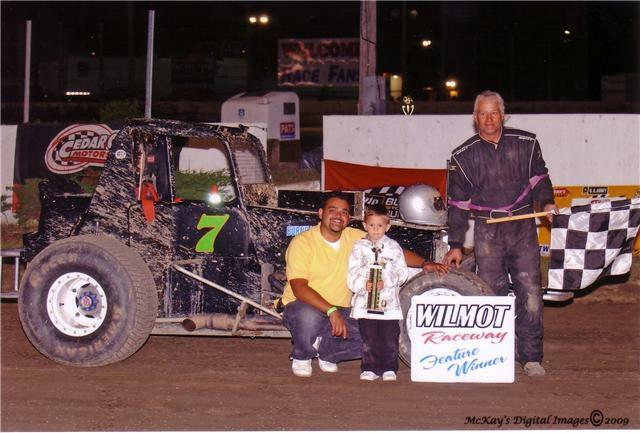 Feature winner Terry Pulver of Wyocena, WI gave his trophy to Michael Sanderson of Lowell, WI.